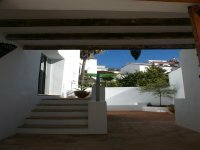 VILLAS AND APARTMENTS TO RENT IN GAUCIN, SPAIN. 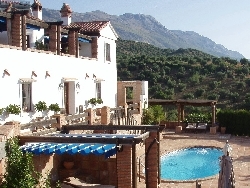 Welcome to our selection of holiday homes to rent in Gaucin, Spain. Located in the hills behind the Costa del Sol, Gaucin is one of the white villages that consist of pretty, whitewashed cottages and spectacular views over the surrounding countryside. What makes Gaucin stand out from the other white villages is its impressive backdrop; the mountains of the Serran�a de Ronda, with the peak just behind the village dominated by the ruins of a medieval fortress. The drive to Gaucin itself makes a day trip worthwhile, winding its way through over 20 kilometres of mountain roads with pull-over places where you can stop and enjoy the different views. While the narrow, winding streets and pleasant squares with their pavement caf�s are well worth visiting, what makes Gaucin truly different from the other villages in this part of Spain is the castle on the peak of the Siera del Hacho, the mountain that dominates Gaucin and the roads that approach it. Known as the Castillo de Aguila or Eagle's Castle it is open over lunchtime and then again in the early evening for visitors to look round. In the tourist season there are often concerts and flamenco shows in the castle courtyard. The town market place has been restored in recent years, and a farmer's market is now held weekly in the months from April to October, allowing local farmers and craftsmen to sell their products to residents and tourists alike. Gaucin has become a popular village with local artists, and for such a small town there are a surprisingly high number of galleries and craft shops. Those who prefer more active pursuits can enjoy walking in the surrounding hills or even explore the region on horseback, as there are two equestrian centres just outside Gaucin. A short drive from the village, there are some outdoor sports centres that have taken advantage of the dramatic scenery to offer activities like rock climbing, mountain biking and caving. One of the most popular walks in the region is along the banks of the peaceful River Genal. As well as being a great place to spot local wildlife, there are some areas of the river where it is deep enough and perfectly safe to swim. A much more relaxing alternative to the busy beaches of the nearby Costa del Sol. If you can't manage a day without your fix of sun, sea and sand, then the nearest beaches are at Manilva and Casares, though these are often quite busy in the summer. Throughout the Genal Valley there are several pretty villages that are worth visiting, though not all are the famous white villages. Genalgaucil is one of the most visited, thanks to the art festival that takes place there annually, while Benlauria is home to a museum about the history of the region. Looking for self catering holiday accommodation in Gaucin? Then below is a selection of holiday apartments in Gaucin and holiday villas in Gaucin that can be rented direct from their owners. You can either click on each listing for further details or you can use our search engine on the left if you are looking for something in particular. Golf - La Duquesa is the nearest golf course to Gaucin. There are a total of 18 holes within the gold course. Entertaining fairways allow any visitor with rounds of golf and fun reserved for those people who enjoy the sun and the cooling Mediterranean breezes. Birdwatching - Gaucin is a major place for bird migration. There are a wide range of birds such as quail, partridge, nightingales, doves, martins and carpenter birds. Gaucin is situated behind the Costa del Sol and is one of the many white villages that are full of many whitewashed houses and stunning views of the countryside that surrounds the village.